Bijou - A gem of a little salon in Skaneateles: HUGE NEWS! Do you remember when we won a salon of distinction in the Salon of the Year competition? OMG, I do, what an honor and achievement. It's based on the decor of your salon. I still can't believe we won, what a dream, what a great feeling, what an honor...I can't tell you how grateful we all felt! 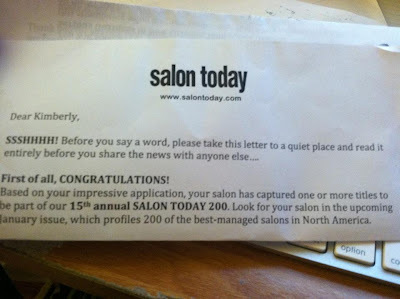 Well you remember me saying on Facebook that I was entering the Salon Today top 200 competition? It all happened so fast because, the years that it is judged are not current years, and you enter the competition the year before the competition runs. And like I said you are judged on prior years. SO this year it was judged from 2009 and 2010, you enter in 2011 and the competition is announced as ST 200 2012. Can you see how easily I got all jumbled, when it was time to actually enter. WHICH is why I almost missed the deadline!! YEP, I almost totally missed it. It was to be postmarked the next day, and I read this at 10pm, ran to the salon and started the reports I needed. OH and essays, I started writing essays while the reports were printing, I was frantic. Do you remember when I wrote THIS? Well I remembered one thing that my favorite editor in chief said at that time...She asked me if I needed more time, because my photos were being process for Salon of the year, literally the day before the postmarked date. She said, "Some other salons needed extensions, so if you need an extra couple of days, I can do that for you." I didn't need it then for Salon of the Year. BUT I needed it now!! I took a leap of faith and emailed her and facebooked her! I kept telling myself, the answer will be NO! if I don't ask that is for sure, and it could be NO! if I do ask, but it could be YES! too. WHY take that chance!? Always ask, you just never know! She responded by telling me to go to bed tonight and that I could have a few days extension. When I got the letter, it was in a plain white envelope. My mail lady (you have to love a small town, she knew we were waiting for this..so brought it to me at my chair) handed it to me and I put one finger in the envelope and then stopped. I remembered that the first year I opened Bijou, I had entered Salon of the year. I received a white envelope the same as this one and inside it said. Thank you for entering, we regret to inform you that you have not placed. BUT when we won the salon of distinction I remember getting a huge gold envelope. SO, I told the girls, I'm not crying in front of clients. I'll wait.. The girls grabbed the envelope and held it under the light, sneaky girls! They encouraged me to open it with them in the quiet room. And since I know how protective they are of me, I trusted they knew it was maybe ok... We screamed. We won!!! We will know what categories we placed in when the magazine comes out in January. Can't wait! SO grateful! Life in 2012 is going to be GRANDE!